Life continues at pace in NPoCC with work on-going across a host of projects as well as maintaining business as usual to support day to day requests for mutual aid throughout the UK. The first three months of this financial year has seen an 87% (1383 > 2576) increase in the number of officer shifts on mutual aid when compared to the same period in 2014 (Apr-June). The general election naturally played its part but we are seeing an overall increase in mutual aid demand. Despite this demand I have a great team of officers and staff who not only excel in their own right but more importantly excel as a team, delivering a quality national policing response to support the service. On the theme of good work by officers I have made mention, in each of my previous blogs, of the tremendous work of UK Disaster Victim Identification (UK DVI). Detective Inspector Howard Way is part of that team and will soon acquire a new piece of silverware to proudly pin to his lapel after being awarded an OBE in the recent Queen’s Birthday Honours. A timely honour for an officer who excels in a demanding role. 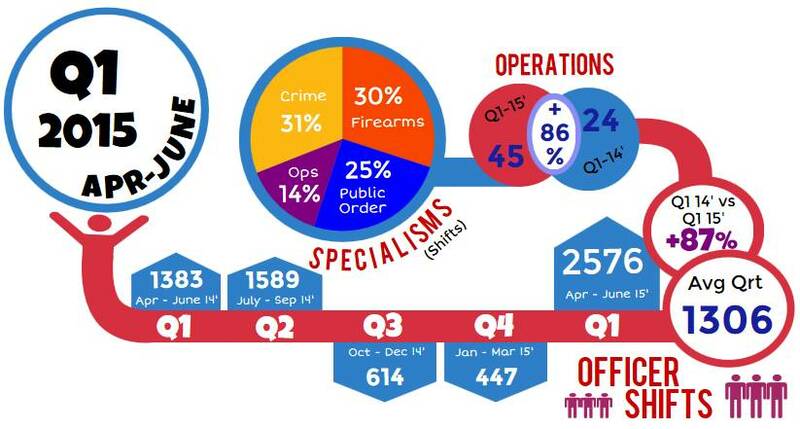 Mapping the capacity of specialist police skills across the service has remained a large part of our work in recent months. Having completed phase one of data capture for 130+ separate specialist police roles we have crunched the numbers and informed National Police Chief Council (NPCC) colleagues of what exists across the service and where it’s based. As with any new project we’ve got some creases to iron out but this has never been done before in modern policing on such a large scale. Never has the service mapped police capacity across so many areas. At a time when budgets continue to reduce it’s already clear that this information will be invaluable in helping inform force decisions around the sharing of officers and staff, collaboration, workforce planning, training and more, all of which allow the service to remain effective. Phase two is now underway, this time supported with a national IT system we have developed allowing forces to easily upload information and for the first time they’ll be able to search and see what there is and where is it at the click of a button. Again, this has never been done before. The work of our unit, as with any business, is aided by people’s awareness of who we are and what we do. Our ability to raise awareness of NPoCC is underpinned by a strong communications strategy underlining how we talk to our stakeholders both verbally and virtually! I’m a big user of social media but the grass roots basics of picking up the phone or better still, meeting someone face-to-face, should never be overlooked. The Twittersphere though is a great way to share and importantly have conversations with people, some who you don’t know and that invigorates me. Last month members of the team attended the Police Federation Conference which proved hugely beneficial for talking with officers on the ground about what we do who in turn take this knowledge back to their force. We also ensure the team regularly get out to meet and brief officers and staff in the regions they support. The feedback they get from these visits and the type of relationship this builds is immeasurable. Looking ahead we’ll also have a presence at both this year’s Emergency Services Show (@emergencyukshow) and the Police Superintendent’s Conference in September. Work has also continued in earnest around our function to test and exercise mobilisation and in particular the services ability to supply public order officers where they are needed and in good time. So far the results are very positive. It’s clear that as a service we are equipped to respond quickly during times of crisis. We continue to link in with those running exercises throughout the UK, including last week’s largest ever CT exercise (Operation Strong Tower), to ensure consideration is given to the wider effect on the service during a major incident. Looking ahead there is a busy summer of events and festivals coming up, the beginning of a new football season which naturally brings an increase in demand for policing high profile games, a Rugby World Cup to look forward to, all of which will require a policing response, and of course there is always the unpredictable which I predict will happen! We are also in the process of having our legal collaboration agreement (Sec 22a) agreed and signed by 54 police forces and agencies across the UK ensuring we operate on a formal legal standing. Here at NPoCC we’ll continue to do all we can to assist forces where additional support is required as well as continuing to drive forward all the work mentioned.